The Democratic-led House of Representatives Judiciary Committee voted to enable its chairman, Jerrold Nadler, to subpoena the Justice Department to obtain Mueller's unredacted report and all underlying evidence as well as documents and testimony from five former Trump aides including political strategist Steve Bannon. Nadler has not yet exercised that authority, with the timing of any such move uncertain. The committee vote was 24-17 along party lines, with Democrats in favor and Trump's fellow Republicans opposed. Attorney General William Barr, a Trump appointee, issued a four-page summary of Mueller's main conclusions last month including that the special counsel did not establish that the Trump campaign conspired with Russia during the election. 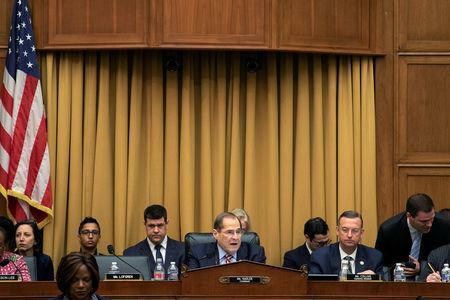 Nadler's panel shifted its focus to subpoenas to obtain the Mueller report when it became clear Barr would ignore a Democratic demand turn it over unredacted by a Tuesday deadline. Democrats have expressed concern Barr could use redactions to suppress evidence of potential misconduct by Trump and his campaign. Nadler said he would work with Barr "for a short period of time in the hope that he will reveal to us the entire Mueller report and all the underlying materials" and will go to court to get permission to obtain the grand jury material. "But if that doesn't work out in a very short order, we will issue the subpoenas," Nadler added. "... The committee must see everything." The potential battle between the executive and legislative branches over the subpoenas could end up being resolved by the federal government's third branch - the judiciary. Representative Doug Collins, the committee's top Republican, said Democrats are "desperate for dirt on this president." In another development, the Wall Street Journal reported that the Democratic-led House Intelligence Committee, led by Trump critic Adam Schiff, is seeking an interview with and documents from a top organizer on Trump's inaugural committee. Barr's March 24 letter to lawmakers explaining Mueller's "principal conclusions" said the special counsel did not exonerate Trump on obstruction of justice. Barr himself subsequently concluded that Mueller's inquiry had not found sufficient evidence to warrant criminal obstruction charges against Trump. Trump ally Lindsey Graham, Republican chairman of the Senate Judiciary Committee, wrote on Twitter that the House panel's demand for classified information and grand jury testimony was "dangerous and ridiculous." Justice Department regulations give the attorney general wide latitude on how much to release from special counsel inquiries. Nadler told reporters he would also seek a judge's permission to get access to Mueller's grand jury material, which is protected under federal law. Nadler said Barr has not been willing to seek a court order to release the data so far. Republican Representative Jim Sensenbrenner said he would be willing to join legal action to obtain the grand jury material and predicted other Republicans would as well, noting that the House voted overwhelmingly last month for the full report's release to Congress.